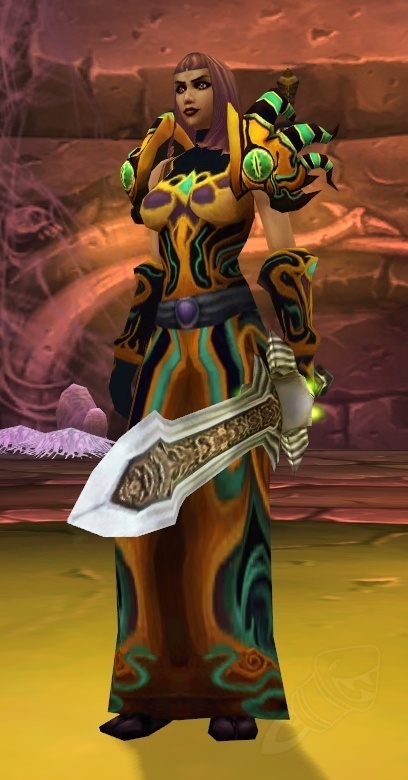 Grand Widow Faerlina is a simple fight, but relies heavily on your Tank and Healer ability rather than DPS. There's not much to understand or do, so she is more or less the gear check boss of the Arachnid Quarter. Poison Bolt Volley - Faerlina will launch a Poison Bolt Volley, hitting the 3 closest to her players for 2,625 to 3,375 (25 Player: 3,375 to 4,125) Nature damage, and applying a removable DoT, that ticks for 1,480 to 1,720 (25 Player: 1,900 to 2,100) Nature damage every 2 seconds for 8 seconds. A simple Poison Bolt Volley ability that will be used often during the fight. Cleansing Totems help immensly, otherwise up your nature resistance and be prepared to cure poison a lot. Rain of Fire - Faerlina will cast Rain of Fire almost randomly, hitting players within 8 yards from each other, for 1,850 to 2,150 (25 Player: 3,700 to 4,300) Fire damage every 2 seconds for 6 seconds. Not a terribly hard hitting ability, but will cause extra damage to your raid, and if you are taking too much raidwide damage, it will help if you move out of this when it's cast. Frenzy - Faerlina will go in Frenzy every 60-80 seconds, increasing her attack speed by 50% (25 Player: 75%), damage done by 150%, and size by 50%. She will also gain the typical for Enrage effects' red color. Killing a Naxxramas Worshipper (25 Player: Mind Controlling a Worshipper and activating the spell) after she uses Frenzy will remove the effect, and prevent her from casting Poison Bolt Volley for 30 seconds. This ability is Faerlina's gimmick, as it drastically increases the damage she deals to your tank. The only way to remove this ability is to kill a Naxxramas Worshipper. For this reason, all DPS should be on Faerlina until she enrages, and then they should immediately switch to one Worshipper and kill them. This ability will also silence her Poison Bolt Volley, and it weakens her. Naxxramas Worshipper - Will use Fireball, doing 2,025 to 2,475 (25 Player: 2,475 to 3,025) Fire damage to their tank. The Worshippers that will be next to Faerlina should be offtanked and not killed until an enrange needs to be cleared. Only the Offtank should be attacking these until an enrage occurs. They are easy to offtank, and the offtank should only need a few heals during the fight to survive. Keep them away from Faerlina so AoE doesn't kill them early. Cause a great deal more trouble during the fight, and should be killed before Faerlina by ranged or non-casters. Avoid entering their silence range if possible. Only appear in 25-man. Build up your Nature and Fire resistance for this fight to kill off a bit of the extra damage recieved. One of the bigger problems will be the Poison Bolt Volley, if you have anyone who can keep that under control (Shaman Cleansing totem works best) they need to be doing so. If your raid is having trouble surviving, move out of the Rain of Fire, otherwise you can ignore it. Tank the Worshippers and Faerlina away from each other so as to avoid AoE damage killing a Worshipper early. When Faerlina enrages, Healers need to focus heal the Tank to keep them alive while DPS will focus fire a single Worshipper down. When the Worshipper goes down, Faerlina will be drastically weaker, and heals should be able to relax a bit more. Continue to repeat the previous strategy whenever Faerlina enrages. After she dies, kill any remaining worshippers.